Almost a foot of rain had sloshed into south Louisiana by late Thursday, flooding a wide area of the state, killing at least one person and causing caskets to float out of their graves. "We really can't clean up or do anything, because rain is predicted for the next few days," Jody Valentine of the town of Gonzalez in Ascension Parish told NBC station WVLA of Baton Rouge. Heavy rain began falling Wednesday morning and was forecast to continue at least through Tuesday, the National Weather Service said. Nearly 50 houses and apartments flooded in St. Landry Parish, Administrative Director Jesse Bellard told The Weather Channel. "We've been running around the parish trying to clean up the drainage problems with logs in the ditches and stuff and prepare for the rains we're going to have later," he said. A 56-year-old man was found dead Wednesday afternoon in a flooded parking lot in Ascension Parish, Chief Sheriff's Deputy Tony Bacala said in a statement. Investigators believe the man, identified as Danny Deville of Melville, was swept under his truck by the rushing waters 12 to 18 inches deep, Bacala said. Ascension and Livingston parishes closed all waterways late Thursday afternoon, suspending all recreational boat traffic until debris-filled floodwaters recede. James Williford of Lake Charles posted striking video of motorists plowing through the flooded street, saying, "I have always wanted beachfront property." 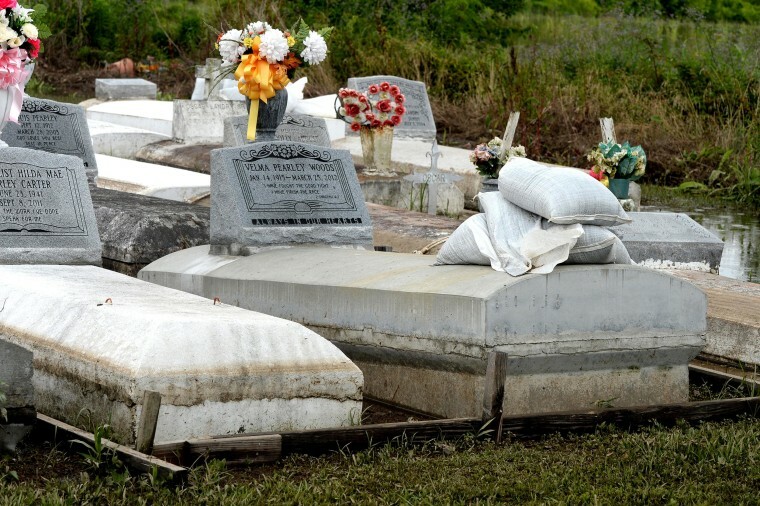 In Belle Rose in Assumption Parish, about a dozen caskets floated out of their graves, trailed by loved ones toting sandbags to try to stop them, NBC station KTVE of West Monroe and the Baton Rouge Advocate reported. Others decided to move the caskets to higher ground, the station reported.